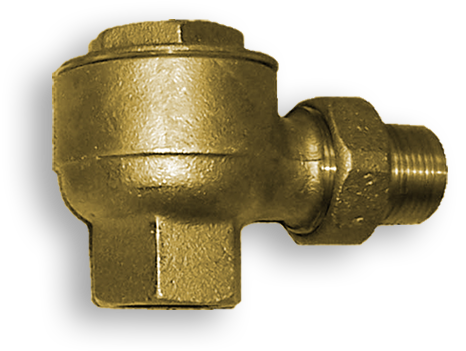 The Sterlco® High Pressure Thermostatic Trap operates efficiently with pressures of 5 to 125 PSI and is applicable to all types of high pressure steam systems and steam process equipment such as sterilizers, coffee urns, pipe coils, etc. Its purpose is to efficiently drain water and vent air from steam equipment and to prevent the flow of steam into return piping. Sterlco® High Pressure Traps are manufactured in three (3) sizes for handling capacities of 125 to 4,500 lbs. / hour. Fluid in the thermostatic disc of the trap is partially vaporized by the heat of steam and an internal pressure is developed which overcomes the surrounding steam pressure. This expands the member and carries the valve toward its seat with a positive force. The Sterlco® thermostatic trap quickly adjusts itself to a position determined by the temperature and pressure conditions encountered and permits either a continuous or an intermittent flow of water and air from the process equipment being trapped at the rate required for highest heating efficiency. Why Choose High Pressure Thermostatic Trap?